Didn’t score tickets to Hamilton? Even those who haven’t seen the pop culture juggernaut firsthand were able to gain insight into the life and times of the founding father, thanks to a pop-up exhibit at the Earth Sciences and Map Library on Friday. 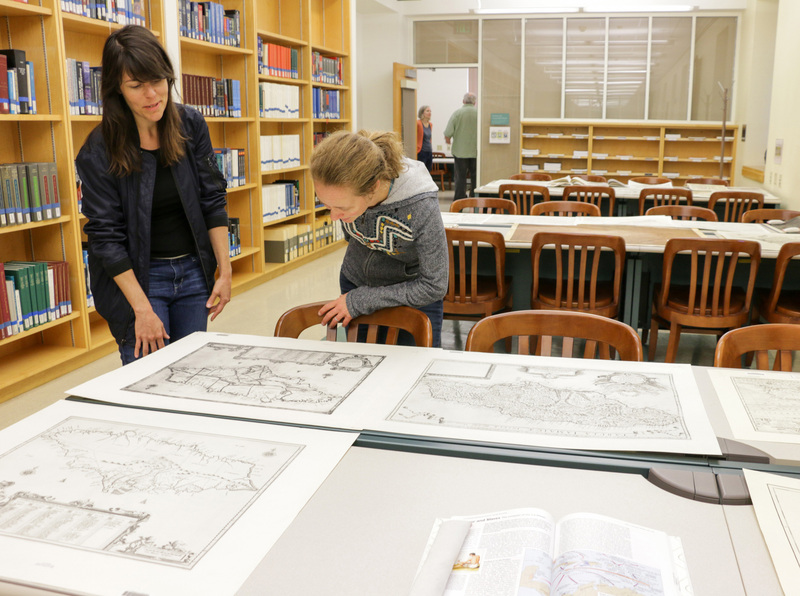 “I wanted to harness the interest people have in Hamilton,” said Nicole Viglini, a UC Berkeley grad student studying history, who co-curated the pop-up Maps and More exhibit, with help from librarians Sam Teplitzky and Susan Powell. This year, as part of the campuswide On the Same Page program, new students and faculty members were encouraged to listen to the Hamilton soundtrack — and are given opportunities to engage with the work and discuss it with others. Using the hit Lin-Manuel Miranda musical as a starting point, Hamilton, in Maps explored the important topics of race, immigration and inclusion. “Maps can help tell the story of African-Americans’ various movements for emancipation and political and social equality,” said Viglini, who highlighted the stories of slave uprisings and of African-Americans’ participation in the Revolutionary War — in which between 20,000 and 100,000 slaves were said to flee to British lines. Among the notable items on display was a copy of the letter Alexander Hamilton wrote about the famous hurricane that set his course for what would become America (and is now immortalized in a song). The exhibit also raised the question of who gets to tell someone’s story — and why some stories are overlooked, a theme that is also explored Hamilton, which, notably, has people of color playing the founding fathers. The Maps and More series, in its fourth year, also aims to highlight the resources the Library has to offer. “One of the goals of the series is to encourage (students to) use the collection,” Teplitzky said.